RF Power Amplifier 3.4 - 3.7GHz 20W Linear WIMAX SM3437-43. SMA (F) IN/OUT High Gain AMP. Max Input: -6dBm for MAX Power. Fully tested. 7 - 8GHz flat response. Fully tested. Good working condition. Actual photos and video. INV: R2M35B01 P0. 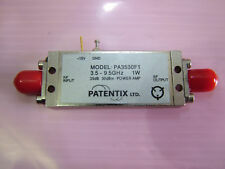 1 Watt RF power amplifier 35dB PA3530F1 also for 5.8GHz Patentix Ltd ITEM ON SALE ! 3.5 - 9.5GHz 35dB 30dBm 15V 470mA. P1dB = 28dBm Gain: 35dB. TESTED WITH 10dB attenuator ( at spectrum input), so below screen reading 20.5dBm add 10dB = 30.5dBm output saturated power. Fully tested report. Good working condition. Actual photos. INV: R2M17B04 P0. 1 Watt RF Power Amplifier 700MHz - 2.5GHz 30dBm AML BP60090001. 30dBm 1 Watt Amp Gain: 37dB 15V 1.27A. 30dBm 1 Watt Amp Gain: 37dB 15V 1.27A. Fully Tested. Low noise N.F 3dB Po: 28dBm. Gain: 44dB PO: 30dBm (1W). 400MHz - 1.2GHz RF power amplifier AMF-3F-00820096-14-30P Miteq. 15V/960mA high gain and high power. Fully tested. Good working condition. Actual photos. WR28 RF power amplifier 37.2 - 41GHz P3741X2. Gain: 23dB PO: 30.5dBm V = 6V -V = -12V. YELLOW: DETECTOR. 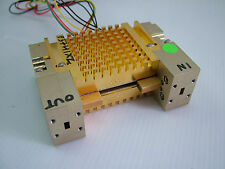 Must have heat sink fan blower (Not included) \ Keep AMP under 50 DEG C.
INV: R4M12B01 P0 INV PATENTIX : P60006. HP 5086-7407 Power Amplifier 2.3 - 7GHz For 8340A/B. Fully Tested. Good Working Condition. Actual Photos. 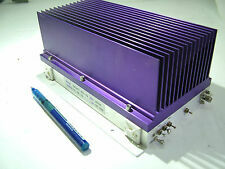 5.8 - 6.6GHz 2.5Watt RF power amplifier CTT APW/120-3422-17. Fully tested. RF Amplifier CTT ASN/145-4450-43. FREQ: 13.94 - 14.44GHz Gain: 50dB PO: 44dBm = 25 Watt. Radio Amateurs. We apply to . Conditiion: Used, good condition. Rate (item arrived). 1PCS FMM5057VF 7.1-8.5GHz Power Amplifier MMIC. Professional one station high-frequency tube,RF. Microwave Amplifier. We apply to Radio Amateurs. Heavy Industry. The item may be a factory second or a new, unused item with defects. Our team will be here to support you all the way from purchasing to the arrival of your item. An item that has been used previously. Model: SM3437 3.4-3.7 GHz. Stealth Microwave. Good Condition! Most of them “SOLD AS IS ”. We are using rice-paper to protect lenses, mirrors etc. In case you are from Israel, V.A.T will be added to total price.